COLLEGE PARK, MD -- Tiny beads of silicon, about ten thousand times thinner than a piece of paper, could someday make electric vehicles travel farther on a single charge or extend the life of your laptop’s battery. Rechargeable lithium-ion batteries – the kind in your phone, camera, and some hybrid cars -- use graphite as an electrode in the battery. Silicon can store up to ten times more lithium ions than graphite, but until now, silicon structures tended to crack or break when they were used over and over. Now chemists and materials scientists at the University of Maryland have designed a tiny silicon structure for batteries that can last through more charging cycles than previous designs did. The scientists grew tiny beads of silicon on a carbon nanotube, then used a powerful microscope to watch the electrode charge and discharge. The work was supported by the NEES Energy Frontier Research Center and NSF. To make the beads, YuHuang Wang, an assistant professor in the department of Chemistry and Biochemistry, and his colleagues attached part of a molecule sometimes found in food flavorings along carbon tubes less than fifty nanometers wide. Then they flooded the space with a gas containing silicon. The organic molecule caused beads of silicon to grow on the tube. Then they charged the silicon with lithium ions. The team watched the tiny electrode in action under the electron microscopes in the NISP Lab in the Maryland NanoCenter. The researchers think the structure is more resilient because unlike flat silicon coatings, silicon beads grow like flexible balloons. The organic molecule that initially attracted the silicon to the tube made the silicon bond to the tube more strongly, preventing the silicon from breaking apart, the researchers found. As the beads were charged by the lithium, they grew and shrank without cracking or ripping. 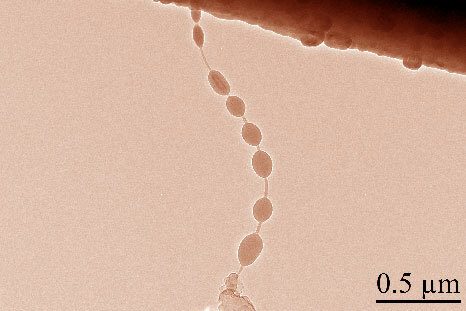 The beads expand outward from the nanotube, but not toward each other, so they can be placed close together along the nanotube. Department of Chemistry and Biochemistry Chuan-Fu Sun, Yin Zhang, Hongwei Liao, YuHuang Wang; Department of Mechanical Engineering: Zheng Jia, Teng Li; Department of Materials Science and Engineering: John Cumings, Khim Karki, Gary W. Rubloff; and at General Motors, Yue Qi. Nanostructures for Electrical Energy Storage, the U. S. Department of Energy’s Energy Frontier Research Center led by the University of Maryland, and the U.S. National Science Foundation, supported the research. The research was published this month in the journal ACS Nano. As the nanobeads of silicon were charged by the lithium, they grew and shrank without cracking or ripping.